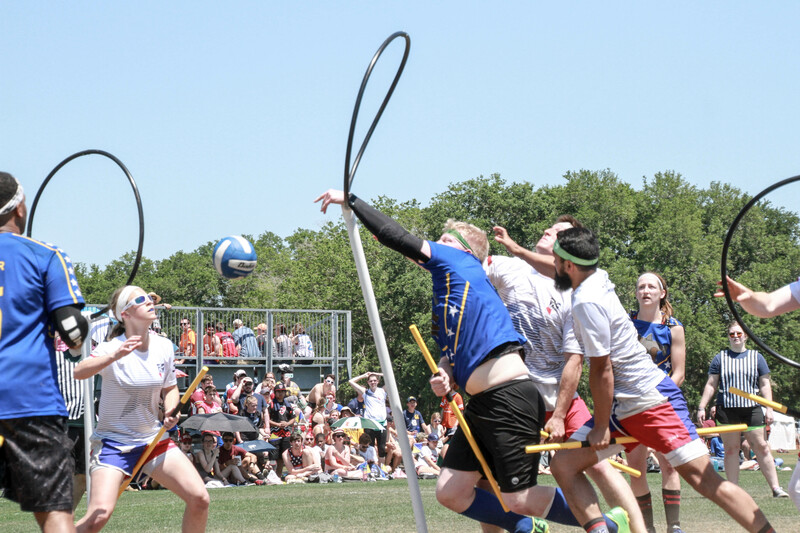 In a thrilling Sweet Sixteen matchup, BosNYan Bearsharks took a stunning 160*-80 upset win over Lone Star Quidditch Club, tabbed by many to be among the true contenders to capture the championship at US Quidditch Cup 10. 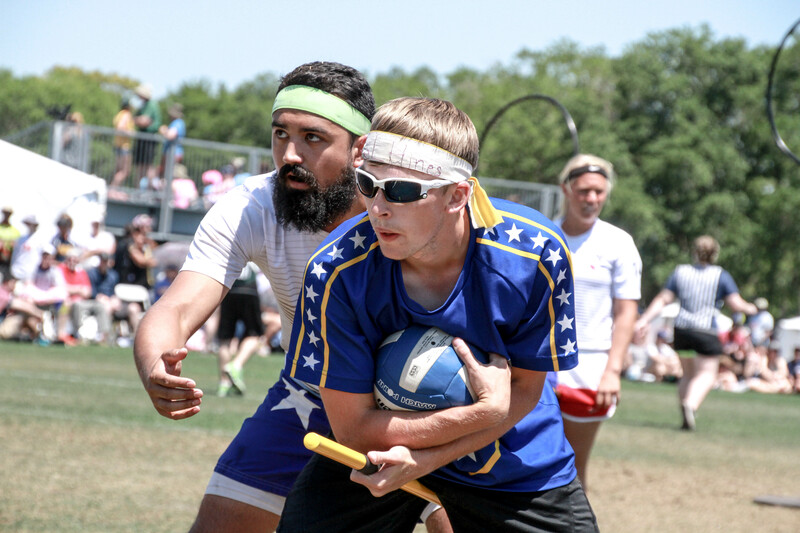 The match featured many of the players involved in last year’s Lone Star/Quidditch Club Boston semifinal at US Quidditch Cup 9, with five former Boston players now playing for the first-year Bearsharks. BosNYan imposed its will from the start of the game, with two dunks from Tyler Trudeau and two more goals from David Fox and Julia Baer. The Bearsharks sprinted to a 40-0 lead before a Luke Langlinais fast break brought the score to 40-10 at the six-minute mark. The gap would never be wider than four goals or closer than two until the snitch came onto the pitch. Lone Star struggled greatly with obtaining and keeping bludger control. Leeanne Dillmann especially, with partners Kyle Jeon and Leslie Hargett, held control very well against the Lone Star’s much-heralded aggressive beaters. This was especially impressive given how often they pressed forward to beat out opposition to clear lanes for a series of powerful drives from BosNYan’s ball carriers. Trudeau put on a clinic, scoring seven of the Bearsharks’ 13 goals, and assisting on two more. He was practically unstoppable once he reached the keeper, powering through double-teams from Lone Star’s usually-stingy chaser defense. Zack Gindes also managed a handful of goals, including two from broken plays cleaned up by his quick hands and hustle. For Lone Star, goals were sourced fairly diversely. Mathieu Gregoire paced his team with three goals, but Lone Star’s famously deep quaffle player rotation did excellently in spreading the ball around. Unfortunately for them, the Bearsharks’ cerebral bludger play, Trudeau’s length at the hoops, and Fox’s crushing tackles at the top of the offense led to many possessions coming up empty. Once the snitch came onto the pitch, chaos broke out. Lone Star was finally able to start consistently gaining bludger control with the Team USA tandem of Tyler Walker and Michael Duquette, and while they didn’t totally take control of the game, they were able to consistently create opportunities for seeker Blake Fitzgerald to secure the win. However, once again, BosNYan’s beaters came to their rescue. While Lone Star focused heavily on seeker play to prevent a Bearsharks catch, BosNYan’s beaters excelled at owning the seeker game while also making defensive stops to push the gap further and further. 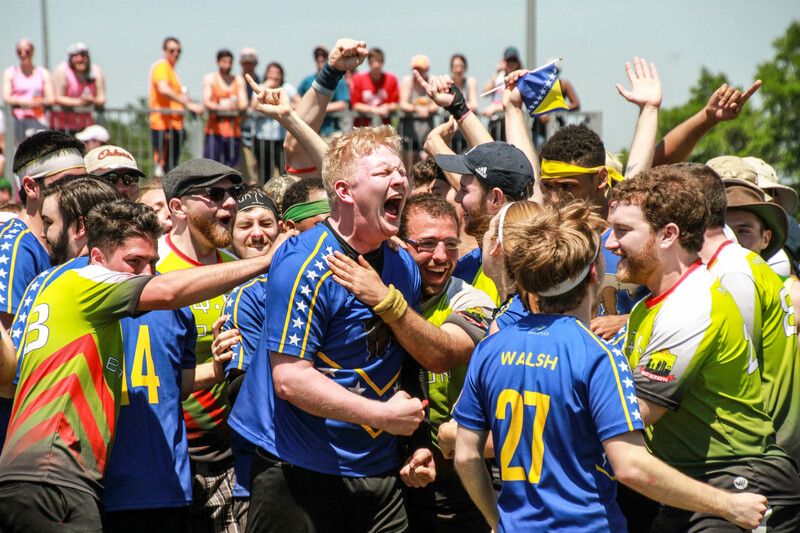 Eventually, after a Fox goal to bring the score to 110-70, seeker Jonathan Ruland for Lone Star caught the snitch, which would have spelled a heart-wrenching 110-100* loss, had it not been for an impending call that invalidated the disastrous catch. Given another chance to pull the game back in range, Langlinais scored on a blazing fast break, 110-80. However, BosNYan’s beaters chipped in to the quaffle game for two more Gindes goals to push the game to a five-goal difference, the first gap of such size all match. Soon thereafter, Jeon subbed in at seeker and made a standing catch in seconds to end the game before Lone Star could make another attempt to bring it back into range, 160*-80.